Have you ever wished on a shooting star? Shooting stars often appear when the earth passes through the dust and debris left by a passing comet. Explore Comets and Asteroids! 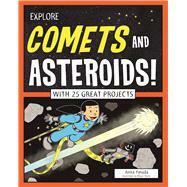 With 25 Amazing Projects takes readers ages 7 to 10 on a fantastic journey through space, where they investigate comets, asteroids, and lesser-known space wonders through 25 experiments and activities designed for curious kids. Readers learn about everything from the first asteroid discovered to many current spacecraft missions. They also investigate famous comets, such Halley’s comet, which returns faithfully every 75 or 76 years. Learning about comets and asteroids means asking lots of questions. Could we live and work on asteroids? Why do we only occasionally see comets? Kids find the answers and more through hands-on projects and experiments that encourage them to be curious about how and why things work. Activities range from mapping the positions of celestial objects to designing spacecraft for asteroid missions. By combining science with activities, fun facts, and cartoons, kids will investigate, create, design, test, and redesign. Explore Comets and Asteroids! inspires kids to want to know more about how these rocky worlds formed and how they may have shaped life on Earth. Anita Yasuda is the author of more than 100 books for children and adults, including Explore Simple Machines!, Explore Native American Cultures!, and Astronomy: Cool Women in Space for Nomad Press. She is a member of the Society of Children’s Books Writers & Illustrators (SCBWI) and the Canadian Society of Children’s Authors, Illustrators and Performers (CANSCAIP). Anita lives in Huntington Beach, California. Bryan Stone is a cartoonist and the illustrator of several books for Nomad Press including Explore Night Science!, Explore Flight!, Explore Rivers and Ponds!, Explore Rocks and Minerals!, Explore Electricity!, and Explore Honey Bees!. He lives in West Fairlee, Vermont. Chapter 1: What Are Asteroids?